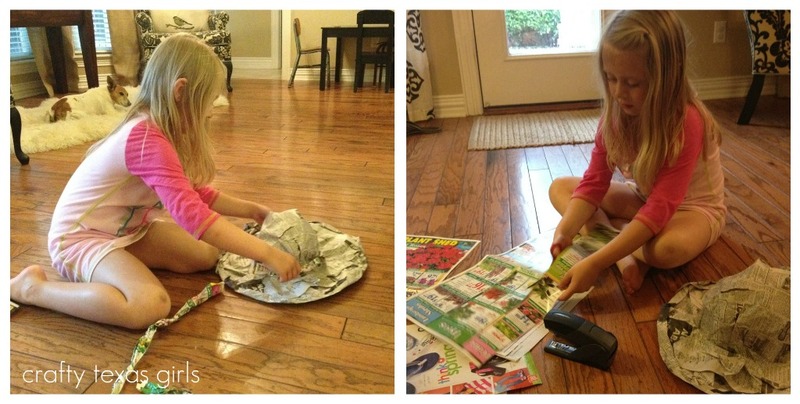 My girl came home last week from school with flyer that read "Make An Earth Day Hat, And You Could Win A Prize!". To a Kindergartner, the idea of getting "a prize" is the equivalent of winning the Mega Millions lottery. 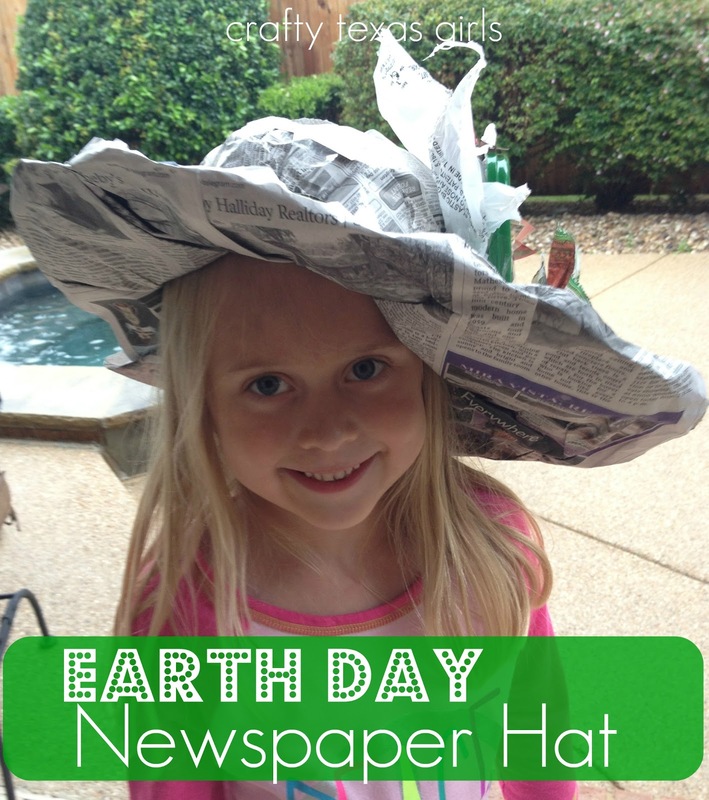 So on Sunday morning, after Jeff was done reading the paper, and the weather turned too rainy to play outside, we decided to work on the Earth Day Hat. Before my girls were born, I taught elementary school. 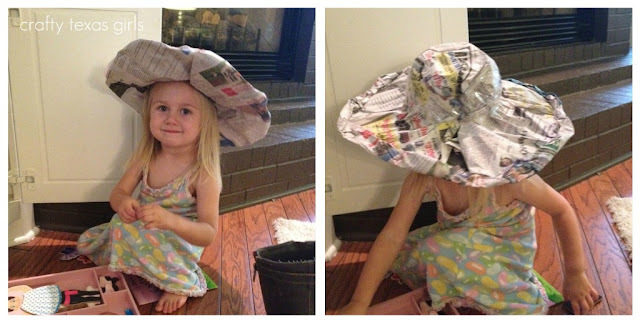 One year, we made newspaper hats for an in-class project. I think it was "Hats Off to Texas History" or something. Which just goes to show, you never know where you will find inspiration for a craft. 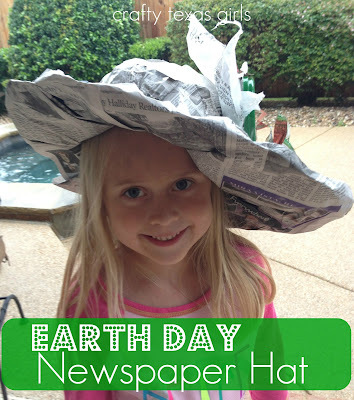 Here is what you need to make your own "Newspaper Hat" for Earth Day or anyday! 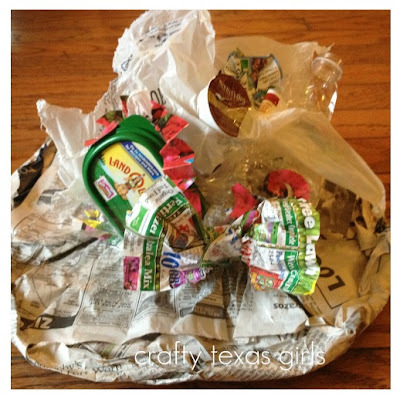 To start, lay 3-4 sheets of newspaper out and arrange them at different angles. Next, you need to size the hat for the 'wearer'. So center them on the head. 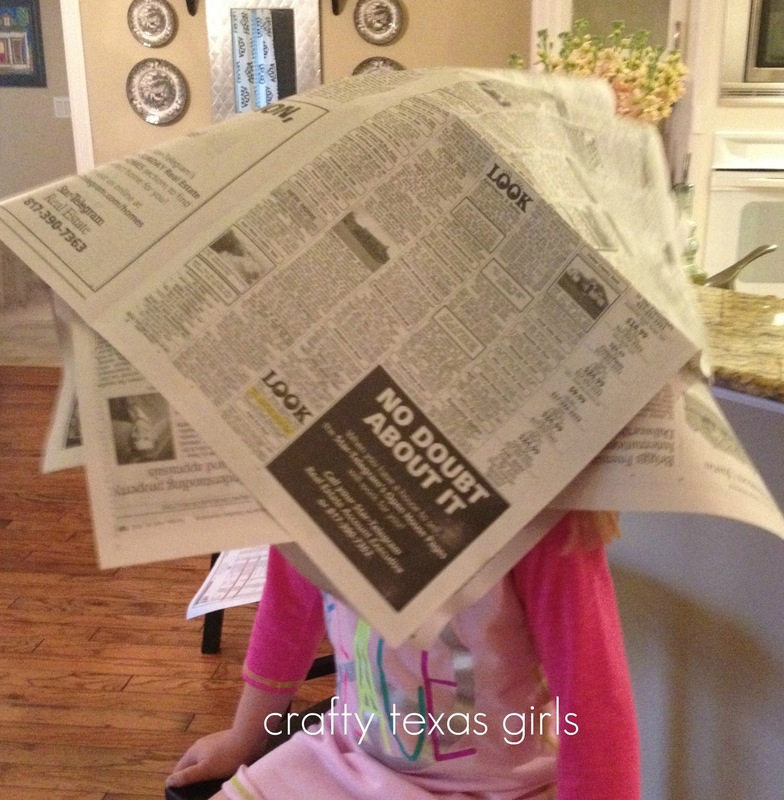 Then wrap tape around the newspaper, just above the eyes. Now you can take the hat off and shape the brim. This is where you can get creative. 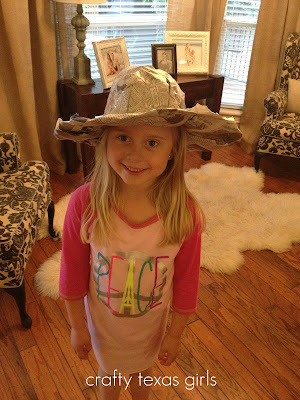 We decided to make a 'Kentucky Derby' style hat. But you could make cowboy hat, a sun hat, a bowler hat, a safari hat etc. 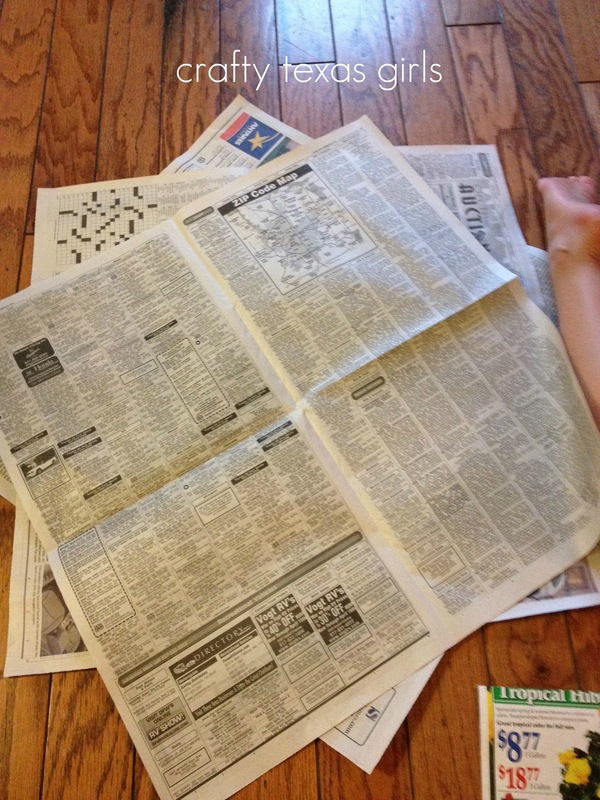 We rolled up the edges of the newspaper and stapled them into place. Then we worked all the way around the hat until it was just right. Next, Afton went digging in the recycling bin. 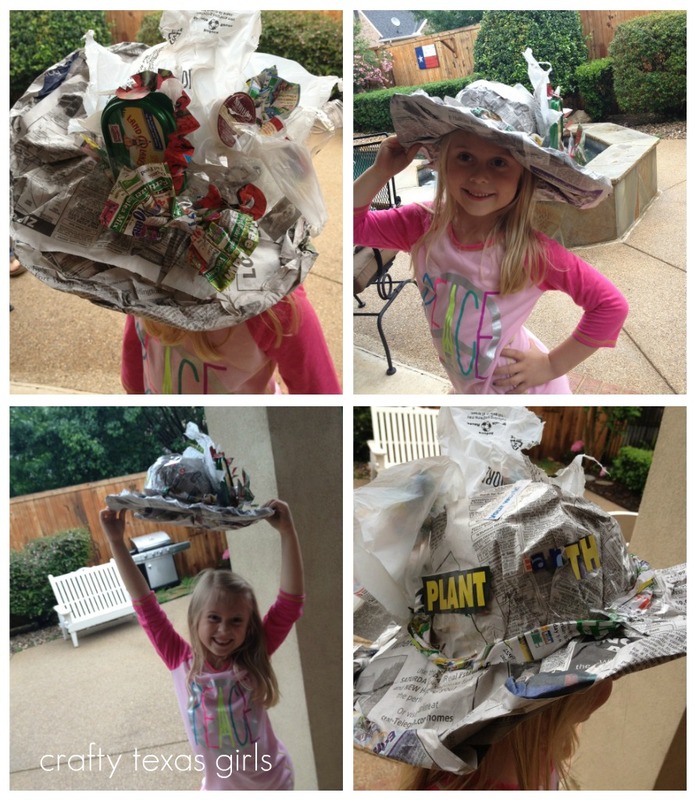 She wanted her Earth Day hat to be made completely of recycled products. She chose some paper from the Sunday newspaper ads, a flattened water bottle, the lid to a butter tub, a plastic bag from Micheal's, a Keurig cup, and a photo of a puppy from the classified ads. Then we started taping it all on. Of course Maisy wanted one too. Afton hopes she wins a prize for her hat! But, if she doesn't, we decided making it together was the best part. This would be a great project for a birthday party. You could spray paint the hats pink, white, yellow, or purple for a fabulous garden tea party. I think it would be cute to add silk flowers, feathers, and glitter. Or for your little guys, shape the newspaper into a cowboy hat and paint it brown. I bet you could even play with the shape and some black paint to create a pirate hat too. What projects have you worked on with your kiddos lately? Got any plans for Earth Day? **Join me later for "Cowgirl Up"-- I have lots of YOUR projects I cannot wait to show-off! What fun! Enjoy this time when they will still do something like that with you! They become teenagers very quickly!